The Canning Doctor: Meyer Lemons! Yes, I know, I have a weakness for: (a) foods that are unusual or with limited availability and (b) Whole Foods. 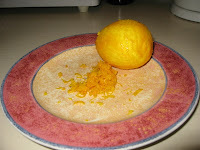 So, in the process of researching the right way to can the kaya, I found lots of recipes f or Meyer Lemons. Hey, guess what? I have been seeing Meyer Lemons in the Whole Foods lately! I made a special trip up there last week to get a dozen lemons and a few vanilla beans. I found this wonderful recipe on line for Meyer Lemon Curd, and added in the canning instructions for lemon curd from here, and made this really delicious curd. Now I just have to think about what to do with it, maybe little tarts? Also, since I had the canner out, I processed the onion pickles from yesterday for 5 minutes. Tomorrow's project, after everyone goes home from the birthday party I'm throwing, is to make a vanilla meyer lemon marmalade. I got out the fancy and super sharp Japanese knife and thinly sliced 6 lemons. They are currently sitting in water with the seeds in a little cheesecloth bag (pectin, maybe?) until tomorrow, when I will add in the vanilla bean and sugar and cook it all up. "super sharp Japanese knife" not pictured here. The super sharp Japanese knife actually flew back with me from Nara, Japan.... in my carry on luggage. It was a while ago. I just completely forgot about it. Meyer Lemon is supposedly less acidic than the more commonly available Eureka lemon. The canning recipe makes the point that they use canned lemon juice to ensure that the result is acidic enough to inhibit bacterial growth after storage. I'm wondering if the Meyer lemon juice is acidic enough. Is there a way to test it? 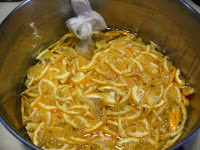 Second: Meyer lemon marmalade. Brilliant! I just picked the last of my Meyer lemons to keep them from freezing in a cold snap. I'm looking forward to giving your recipe a try. Regarding the acidity question - I really don't know. The batches I've made have not spoiled. Maybe because we ate them too fast? But I didn't store them in the fridge until they were opened. If you aren't interested in taking that risk, once you can them you can store them in the fridge, which is what I did for the kaya, since it wasn't acidic enough. The Meyer lemons are easy - plant the tree, and throw a few sacks of mushroom compost over the root zone once a year. Most of the Meyer lemon fruit I see around here is huge - more the size of navel oranges. You're right - the lemon curd recipe is wonderful, and set up beautifully. I like that it doesn't take half a carton of eggs to make, either. I did can my curd in a water bath, but I'm taking your advice and keeping it in the fridge. I don't think we'll have it around very long, anyway. I'm thinking of making a lemon cake, filled with lemon curd, for Christmas dinner. 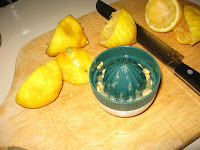 A little lemon juice is added to acidify other fruits when BWB preserving. Being just lemons and juice, it is PLENTY acid for BWB.